Goldeneye 007 was easily Nintendo's most successful thid-party success on Nintendo 64, but that also meant it came with plenty of licensing loopholes that made iappearing on other consoles a serious faff. Remember how it never appeared in last year's Rare Replay on Xbox One, despite being Rare's most beloved game? Those very same loopholes and redtape were clearly too much as, despite the game being close to a releasable state, Nintendo and Microsoft simply couldn't come to an agreement on how to licence the game. Basically, it was all about the money. All that cash spent developing a port everybody wanted, brought to a crashing halt by a squabble over who would get all the royalties when it sold like Bond-shaped hot cakes. Still, as a poor consolation prize, we can all now bathe in its unrelesed brilliance thanks to a new leaked video that shows off over 30 minutes of in-game footage. Brought out into the wild by notorious leaker Rare Thief, the unreleased build shows the game running at 60 FPS, with the option to flit between the HD and the original versions at will. Along with the full campaign (imagine how good Facility would have been in HD? Sigh), the port would have included a set of brand new multiplayer maps (Depot, Frigate and Dam) and a few technical tweaks such as making all multiplayer models the same height (remember how playing as Oddjob gave you a serious advantage back in the day?). Goldeneye 007 would eventually appear on other consoles, only this time it was completely rebooted with Daniel Craig replacing Pierce Brosnan and a loosely similar storyline on Wii in 2010 (ported to PS3 and Xbox 360 a year later). It really wasn'y the same (despite actually being pretty decent), and we couldn't help imaging just how ace an online-enabled version of the original would have been. So yeah, what could have been and all that, but still, look how brilliant it would have been. 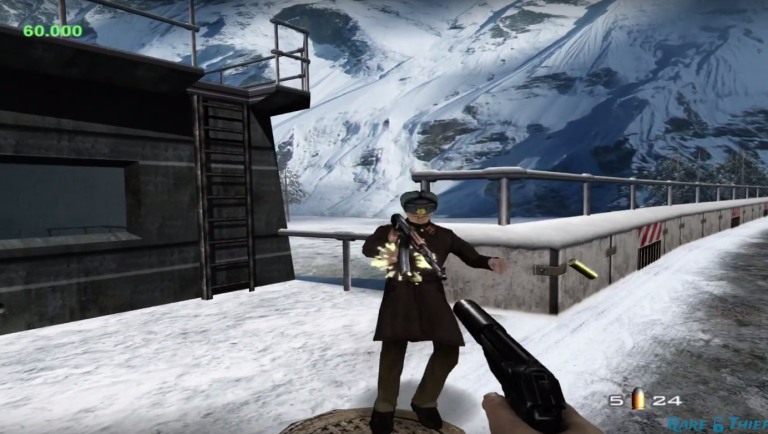 At least, there's still Goldeneye Source, the PC-only fan remake rebuilt in the good ol' Source engine. Sigh. It's just not the same.